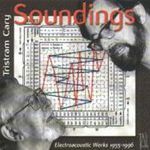 Soundings : electroacoustic works, 1955-1996 / Tristram Cary. Nonet : computer music / by Tristram Cary. Calif. : Stanford University Dept. of Music, 1979. Anthology of Australian music : electroacoustic music [CSM 4].